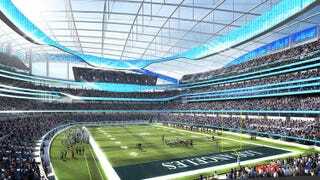 The Los Angeles stadium game is getting serious: this week, NFL owners will hear two different proposals for new stadiums in L.A. And as the Los Angeles Times revealed yesterday, each stadium would be designed to hold two different NFL teams. This is a competition on all sides. Is is not just San Diego and Oakland competing against L.A. for the Chargers and Raiders, and St. Louis fighting to keep the Rams from going west, but the teams themselves are facing off against each other to come up with the stadium proposal that will win over the three-fourths of owners needed to approve a relocation. That vote won't take place just yet, but expect the politicking to occur in earnest at the NFL owners' meetings in Arizona this week. The Chargers and Raiders have already unveiled plans for a shared stadium, but at a presentation today, Rams owner Stan Kroenke will offer the first detailed designs for his proposed Inglewood Stadium. And from the glimpse he gave the Times, we've learned something fascinating: the NFL is apparently set on making Los Angeles a two-team city. Kroenke doesn't need to partner with another team to finance the stadium, but the NFL sees L.A. as a two-team market and wants venues to be capable of hosting both. The Inglewood plan is two-team compliant, which means it has two home locker rooms, identical sets of office space, and two owners' suites. Whereas the Carson proposal is based on the Chargers and Raiders simultaneously relocating, it is widely believed Kroenke does not want to share the market with another NFL team right away, and, because he would be assuming the risk of the stadium by himself, would want to reap the benefits of getting his team up and running as L.A.'s sole franchise. Some might question the wisdom of the NFL committing to putting two teams in a market that hasn't proven capable of supporting one, and doing so at a time when football is enjoying peak profitability thanks to an unsustainable TV rights bubble. Others might just point out that the last time Los Angeles had two teams, it ended poorly. Here, via the L.A. Times, a few more renderings of Stan Kroenke's proposed Rams stadium.